LETHBRIDGE, Alta. 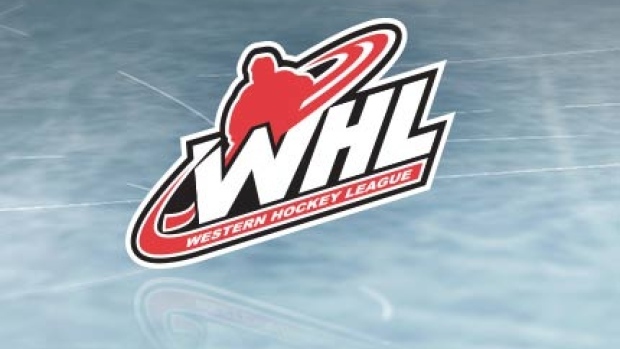 — Nolan Jones scored 1:50 into overtime as the Lethbridge Hurricanes slipped past the Red Deer Rebels 5-4 on Sunday in Western Hockey League action. Taylor Ross had a hat trick in regulation time for Lethbridge (14-8-5) and Dylan Cozens also scored for the Hurricanes. Brett Davis had a pair of goals for the Rebels (17-9-2), while Chris Douglas and Zak Smith added singles. Carl Tetachuk made 28 saves for the Hurricanes and Ethan Anders stopped 36 shots for Red Deer. Lethbridge went 1 for 3 on the power play and the Rebels could not score on their three man advantages. REGINA — James Hamblin scored with 90 seconds left to play to lift Medicine Hat over the Pats. Bryan Lockner and Josh Williams also scored for the Tigers (13-13-3). Sergei Alkhimov and Austin Pratt scored for Regina (8-20-0). PRINCE GEORGE, B.C. — Vladislav Mikhalchuk struck twice as the Cougars subdued Victoria. Josh Maser's goal at 3:07 of the second period was the winner for the Cougars (11-14-3), while Rhett Rhinehart and Ilijah Colina also scored. Tarun Fizer, Dante Hannoun and Matthew Smith supplied the offence for the Royals (13-10-0). CALGARY — Kaden Elder scored twice, including the power-play winner, as the Hitmen sank Moose Jaw. James Malm also had a pair of goals for Calgary (12-14-3) and Egor Zamula also scored. Justin Almeida scored for the Warriors (15-6-4). Hitmen left-winger Luke Coleman earned a five-minute major and a game misconduct for boarding 22 seconds into the third period. LANGLEY, B.C. — Davis Koch's power-play goal at the 13:49 mark of the third period was the winner as Vancouver doubled Tri-City. Jared Dmytriw, Aidan Barfoot and Milos Roman also scored for the Giants (20-6-2). Blake Stevenson and Isaac Johnson scored for the Americans (14-11-1). PORTLAND, Ore. — Joachim Blichfeld had a hat trick as the Winterhawks flew past Kootenay. Cody Glass and Lane Gilliss had two goals apiece for Portland (16-10-2), while Michal Kvasnica, Reece Newkirk and Jaydon Dureau rounded out the attack. Nolan Orzeck and Peyton Krebs replied for the Ice (7-20-4).